Spray 13 x 9 inch baking dish with cooking spray. I boil my chicken in salted water while the Manicotti is cooking. Cook Manicotti according to package directions for 6-8 minutes, leaving it a bit undercooked. (it will cook further in the oven) Drain noodles and set aside to cool. Dice or shred chicken. In a medium bowl, stir together the remaining ingredients until thoroughly combined. Stir in chicken. Stuff shells with a teaspoon at a time of the chicken mixture. 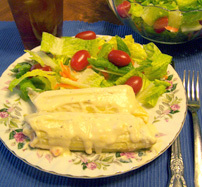 Place in baking dish and cover with your choice of alfredo sauce or marinara sauce. Bake for 25 – 30 minutes or until heated through.